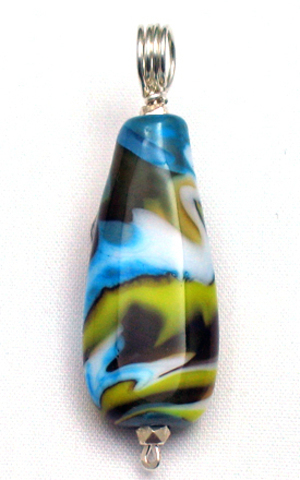 This flat teardrop shaped lampworked bead was made using turquoise as the base. To that thin lines of yellow, white, transparent amethyst, and blue were wrapped around the bead. A pick was used to manipulate the molten glass and create the patterning before final shaping and flattening of the bead.